It’s remarkable, the amount of choice we have in today’s kitchen. So much so, it’s often confusing! Too many choices can make it a challenge to equip your kitchen with confidence. Take, for example, one of the baker’s basic staples – the rolling pin. With so many options, even right here at JK Adams, how do you choose? STRAIGHT DOWEL PINS | Like our top-ranked pin, these straight-barrel pins offer maximum flat surface area and typically a bit more heft than a tapered pin. Great for pounding dough (and crushing various ingredients for all types of cooking, not just baking), a straight dowel pin is typically best with a slight texture, so it can hold a dusting of flour. Many models, particularly those made of super-smooth materials such as nylon, plastic or non-stick metal, just can’t hold onto flour, so the dough will stick to the pin. Our Plain Dowel Rolling Pin stands out amongst the competition because its slightly textured hardwood surface is the perfect answer to sticky dough, and at 19” long it can handle all jobs big and small. TAPERED PINS | These French-style pins are not just aesthetically-pleasing classics, but their tapered ends and slightly lighter weight make them extremely maneuverable and highly functional. But beware the pins with too much taper! Some pins on the market taper from the middle and sometimes quite steeply, all the way out to the ends, offering little or no flat surface in the center of the pin where you need it. Look for a pin with sufficient flat surface in the center, then a gentle taper to the ends. The JK Adams French Tapered Rolling Pin has a generous 6” inches of flat rolling surface, and just enough taper to balance optimal maneuverability and consistent dough thickness. HANDLED PINS | Chances are your grandmother used a pin like this, and for good reason – they have (pardon the pun) “handled” the job extremely well for generations! Designed with a handle on each end and built with either nylon or steel bearings inside, you get optimal pressure control, a generous flat surface area, and substantial yet not overbearing weight – all with less work for your hands. What you might sacrifice in maneuverability and surface area, you gain in less fatigue. JK Adams offers several models with this design, most notably the 3rd place winner in America’s Test Kitchen review, the JK Adams Gourmet Rolling Pin, whose nylon bearings offer durability and ease of use at a great price. For an extra measure of durability and smoothness, you might consider the JK Adams Patisserie Rolling Pin, a favorite of professionals made with precision steel bearings, a smooth 12” waxed hardwood barrel and finely crafted handles. 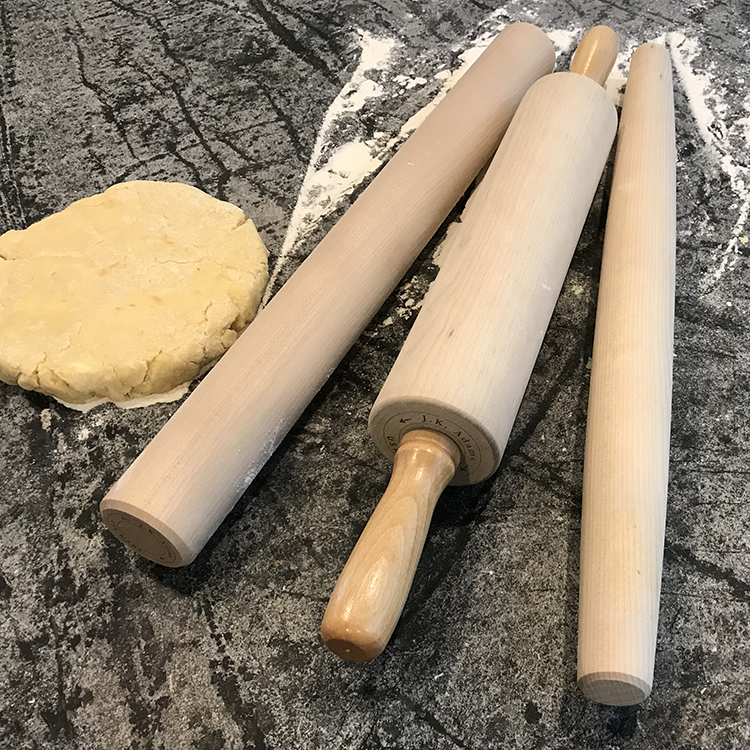 And as a great gift for young bakers, our Mini Rolling Pin is the perfect basic pin, every bit as well made as our Gourmet Pin, great for baking with Mom or Grandma, playdough, and more. PRECISION PINS | Gaining great popularity, especially for tasks that require consistent thickness across a wide surface area (think pie crusts, shortbread cookies and fondant), precision rolling pins like our exclusive Lovely Rolling Pins, make quick work of rolling out a consistent 1/4”- or 1/8”-thick dough. While others offer “ring-sets” that you can apply to standard pins, the rings are easily lost, don’t always fit the pin or hold their position consistently, and can limit the diameter of the dough. Not to mention the often-higher cost! Our Lovely Rolling Pins offer the widest rolling area of any precision pin on the market. These one-piece precision hardwood pins offer all the benefits of a straight dowel wood pin with super-smooth maneuverability and foolproof thickness control. ALTERNATIVE MATERIALS | I’ll admit we are a bit biased to wood here at JK Adams – it’s what we do. But we are well-aware of, and have carefully studied, a variety of alternatives in rolling pin manufacture, and can honestly report that nothing beats North American hardwood for rolling pins. You will find pins made of Non-stick metal, solid aluminum, solid nylon, marble, granite, even glass (careful there!). Most of these materials are attractive for their “perfect” smooth surface texture. But the knowledgeable baker knows that perfectly smooth is often the enemy of working with dough. The key is having just enough surface-texture to hold a dusting of flour, so as not to allow dough to stick to the pin. The very nature of dough causes its tendency to stick to everything, even non-stick aluminum. Only hardwoods have just the right amount of porous texture to hold a dusting of flour to prevent sticking while providing a perfectly smooth result. And for those who use chilled marble or aluminum to preserve the cool temperature of the dough, the pros at America’s Test Kitchen have demonstrated that even wood pins can be chilled and held within just a couple of degrees of their stone / metal counterparts. What’s more, many of these alternative materials cost substantially more than wood. In the end, you can’t go wrong with one of our award-winning rolling pins, or our customer-favorite Lovely Rolling Pins. Happy baking! Bill Eyre is Chief Marketing Officer at JK Adams | You can see the complete results of the Cook’s Illustrated Equipment Review of Rolling Pins here. A subscription is required to view the full report that demonstrates their findings, however, they often offer a free trial subscription.